Embaly Summer School London UCL (Embassy Summer London UCL) at a university in the center of the capital invites students to summer courses from June 22 to August 31. The Embassy Summer London UCL programs are designed for students aged 14 to 30 with varying degrees of English proficiency. UCL is a member of the TOP-5 of British and TOP-25 world universities. There is a special atmosphere in its campuses. Foreign students of summer courses can here not only improve English, but also quickly adapt to the British university environment. The methods of the Embassy Summer school are capable of giving a listener much more than a standard school program for a few years in a very short time. 1.Embassy Summer is not Welcomes the "mass" approach, but works "for results": in groups of no more than 15 people. 2. You can begin with any level of language knowledge (even if the phrase "How do you do?" Already mentions nothing to you). 3. The maximum effective load, taking into account the employment of "students": 15 hours per week with 4 lessons per day. 4. Embassy Summer provides all the necessary teaching materials. [999.17 ] Teachers of the school are of the opinion that dry formalized training is ineffective, therefore each "student" has a unique opportunity to participate in the work of the club of culture lovers, which in a sense can be called another kind of educational process. Classes of the club usually take place in the form of lectures or debates, where students learn a lot of new and interesting things about places that are somehow connected with the outstanding representatives of English literature. Often similar conversations are supplemented by appropriate excursions, which often show much greater efficiency than boring memorization of phrases and expressions. For those who study in England and are completely confident in their own abilities, EmbassySummer offers a unique opportunity to take an English test in the homeland of Shakespeare, Jerome and Dickens. This is a very serious test, the result of which is assessed on a 12-point scale, and the assessment fully meets the criteria of the Common European Frame of Reference (CEFR) standard. Please note that applications for participation in Trinity Exam must be submitted during the initial online booking, and you can reserve the place until May 30. Cost: £ 768 per week. Excursions (from 2 to 6 excursions per week, optional). Day activities at the school involve a sports and excursion program. The first includes team games in London parks. The second is to visit the interesting places of the capital (museums, galleries, cathedrals, theaters, prison and Tower Bridge). Evening activities are not limited to school discos and parties. Students over the age of 18 can spend time in the pubs and bars of the capital of England. The cost of language courses for Embassy Summer London UCL includes field trips (1 every week) by bus, train. Local events are held 3 times a week. For travel, students must purchase travel by metro. Among the destinations most often foreigners choose Cambridge, Brighton, Oxford, Canterbury. Thematic excursions also attract the attention of students. The most interesting are Buckingham Palace, Madame Tussauds Museum, Windsor, Kew Botanical Gardens. 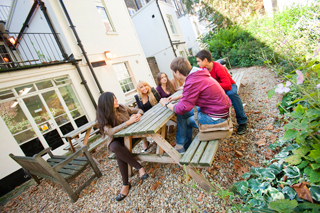 In summer school Embassy Summer London UCL students are offered comfortable safe accommodation. Residences on campus are guarded around the clock. To solve organizational and everyday issues, administrators work in each of them. Foreigners are offered accommodation in full or half board. Residences Ramsay Hall and UCL Halls offer single and double rooms. Bathroom in one and the other building is provided with one for 5 rooms. Kitchens are on the floors in the general use of students. Half-board or full-board meals are served on a five-day basis. At the weekend, students receive vouchers, which can be used in dining rooms, supermarkets, cafes in London. From St. Pancras to the school 15 minutes drive. Within 45 minutes you can get from Heathrow. A little over an hour takes a transfer from Gatwick. An hour and a half will be spent on the road from Stansted and Luton. Modern lecture rooms are equipped at Embassy Summer London UCL. A separate sports infrastructure on the campus is not provided (events are held in London parks). Each of the school's residences has its own dining room. Internet on the campus is available only in administrative offices. Near the school there are several cozy Internet cafes. Extra money to pay for trips, laundry, phone calls and any optional excursions. We have boys-pogody, so in summer they often rest-go somewhere together. This summer decided to try to send to the English camp abroad (they are 15 and 16 years old): we plan to study further in Moscow, but English is always useful. Yes, and the descriptions of the camps liked - they realized that the children will not be bored, because many interesting things are planned. Here, thanks to the managers of Smapse (Alexander sends warm greetings! ), Which supplied us with a mountain of useful information, booklets, photographs and others like them. The trip, in our opinion, passed without a hitch without a hitch (the children were too lazy to write a review and asked me to puff for everyone). We chose the language camp Embassy Summer London UCL : high school. on the basis of which they work, I even know myself (I work for an international company, and some young people have studied with us abroad, UCL are referred to as a super-prestigious place). We must pay tribute to the fact that, for all the eliteness of the place, the price for the summer camp was average in the market: for example, we looked at the options in Oxford, and so many bends are out there, probably for the place and for the reputation, because I do not think that in London, the quality is worse. We did not have the task of maximally "pumping" the English language - rather, it is useful and fun to spend time, but lessons, of course, here as a pleasant bonus, English is now needed by all. The group was picked up by a good one - all peers were boys (they were in the same class), everyone knows about the language with an equal (they are neither super-intelligent nor lagging, who can not connect two words) - such a distribution is, of course, a big plus. I would like to have a little less people in the groups (there were 14 people in our country, in my opinion, there is a maximum of 15), but Russian classes are completed even denser, so there is nothing to worry about. Again - something if you do not understand, it was always possible to approach the teacher for advice, not to wave it off from anyone (true, full-time personal lessons like a tutor for an additional fee). And the entertaining part just did not disappoint us - we had to expand the family cloud, so that we could fit all the photos of the video that the guys took and sent us. And how to ask them - maybe we will remove something that is not very important? - the answer is the same: What are you doing! This is us in London, these are our friends, and this is what we went on a trip to Brighton, and this is the Tower, etc. In short, the impressions for a whole year ahead - which is our goal. Thank you for organizing the trip! The guys will be campaigning friends and classmates next year, so maybe we'll organize a small group trip.